UNITED NATIONS (CNN) -- The United States on Sunday accused Russia of trying to overthrow the government of the former Soviet republic of Georgia, where Russian troops have been battling Georgian forces over the breakaway territory of South Ossetia. Zalmay Khalilzad, U.S. ambassador to the U.N., alleges a Russian official said Georgia's president "must go." At an emergency session of the United Nations' Security Council, the U.S. alleged Russian Foreign Minister Sergei Lavrov told U.S. Secretary of State Condoleezza Rice that Georgian President Mikheil Saakashvili "must go." "This is completely unacceptable and crosses a line," said the U.S. ambassador to the U.N., Zalmay Khalilzad, who made the allegation. In a crackling exchange of a type rarely seen since the end of the Cold War, Khalilzad asked Russian Ambassador Vitaly Churkin whether the Russians were seeking "regime change" in Georgia with the military operation they launched Friday. In response, Churkin objected to the disclosure of a confidential phone call between top diplomats and said "regime change" was "an American expression." The term was one the Bush administration used to describe its goals in the 2003 invasion of Iraq, which Russia opposed. But Churkin said some leaders "become an obstacle" to their own people, and "some situations take courageous decisions with regard to the political future." "Sometimes there are democratically elected or semi-democratically elected leaders who do things which create grave problems for their countries," Churkin told reporters after the meeting. "So sometimes, those leaders should contemplate how useful they have become to their people." The pro-Western Saakashvili came to power in Georgia's "Rose Revolution" in 2003 and was elected president in 2004 and 2008. His government has strong U.S. backing, has contributed troops to the American-led war in Iraq and applied for membership in NATO. Georgia's ambassador, Irakli Alasania, said Churkin's meaning was clear enough. "For me, it confirms that what the Russian Federation is seeking through this military aggression and invasion is to change the democratically elected Georgian government," Alasania said. Khalilzad said the United States plans to offer a draft resolution calling for an immediate cease-fire in Georgia, accusing Russian forces of impeding the withdrawal of Georgian troops from the territory. Though Russia could veto the measure in the Security Council, he said Moscow "is on the wrong side here" and risked damaging its ties with Washington and the West. 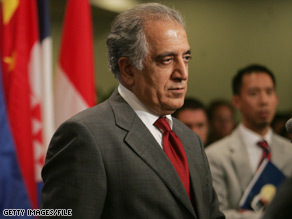 "The days of overthrowing leaders by military means in Europe -- those days are gone," Khalilzad said. The situation in South Ossetia escalated rapidly from Thursday night, when Georgia said it launched an operation into the region after artillery fire from separatists killed 10 people. It accused Russia of backing the separatists. Russia sent tanks to South Ossetia on Friday, saying it wanted to protect its peacekeepers posted there following cease-fires in years past. By Sunday the conflict was raging in other parts of Georgia as well, including another breakaway area, Abkhazia, located in northwestern Georgia. Each side accused the other of killing large numbers of civilians. Russia said at least 2,000 people have been killed in South Ossetia's capital, Tskhinvali. Churkin repeated Russia's position that it is responding to Thursday's Georgian attack on South Ossetia, which, although inside Georgia, has an autonomous government that is backed by Moscow. Churkin said Russia's military action is a humanitarian campaign aimed at blocking the "ethnic cleansing" of Ossetians by ethnic Georgians. He also challenged Khalilzad's argument that Russian forces were waging a "campaign of terror" there, essentially telling council members to consider the source. "This statement, ambassador, is absolutely unacceptable -- particularly from the lips of the permanent representative of a country whose actions we are aware of, including with regard to civilian populations in Iraq and Afghanistan and Serbia," Churkin said. But Churkin drew a rebuke from other Security Council members, including its current president, after he questioned the objectivity of a top U.N. official who briefed ambassadors on the conflict in Georgia. The Security Council's president, Belgium's Jan Grauls, said he was "surprised and dismayed" by Churkin's swipe at Lynn Pascoe, the U.N. undersecretary for political affairs. Churkin said Pascoe's briefing, which included a statement from Secretary-General Ban Ki-moon, "shows that the Secretariat of the United Nations and its leadership was not able to adopt that objective position that is required by the substance of this conflict." CNN's Richard Roth and Joe Vaccarello contributed to this report.